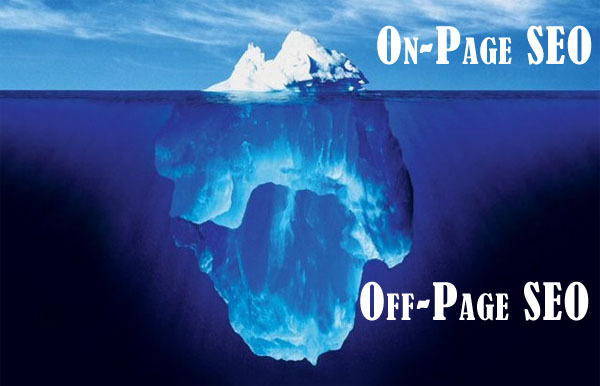 On-page SEO isn’t ineffective as a whole, old on-page SEO is. The web is full of well optimized pages now a days. The goal isn’t to outperform a poorly optimized page in search results, but to do the same to a page that is basically optimized from an on-page SEO viewpoint. A simple way to outrank such a page in SERPs is through the use of advanced on-page SEO methods. Here’s how you can do it. Proper use of the HTML Tags, like <h1>, <strong> / <b>, <p>, <img alt=”blah-blah-“>. Optimized Meta Title, Description etc. Simple, easy-to-use site navigation, preferably hierarchical. Placement of targeted keywords at the start of the title or the first paragraph. 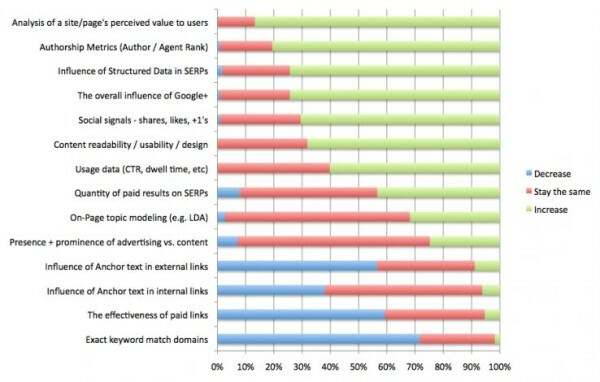 Use of SEO-friendly URLs that include the target keywords in them. Using caching, CDN etc. to reduce page load times. Making sure that links on pages aren’t dead. The common ones still work, but are not as effective as they used to be. Usual on-page optimization tactics are now just too mainstream. As you already know, quality content alone isn’t enough for getting lots of search engine traffic. To outrank pages relying only on these basic optimizations, you should go the advanced route. Once you have a set of target keywords, you can use many variants of them in your content. Modern search engines are smart enough to recognize the synonyms of commonly used words. You can place synonyms of such words, and variations of the important phrases, throughout the content. Google’s own ‘searches related to’ (if available) and something like Thesaurus.com should help you in the process. For example, Google considers terms like ‘increase’ and ‘improve’ very related to the term ‘boost’. 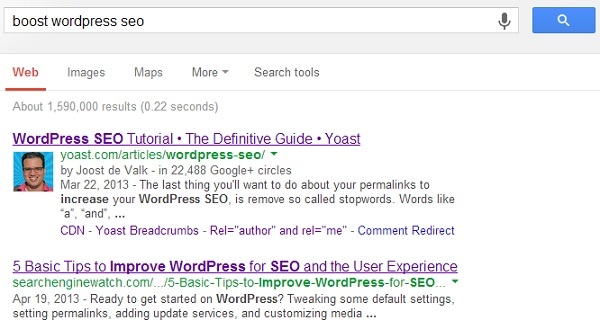 So, if a user searches for “boost wordpress seo”, Google will likely return good results in which such variants of the actual keyword are more prominent. If you properly implement this strategy in your website, you’ll notice that your site’s contents are ranking higher for relevant long-tail keywords. 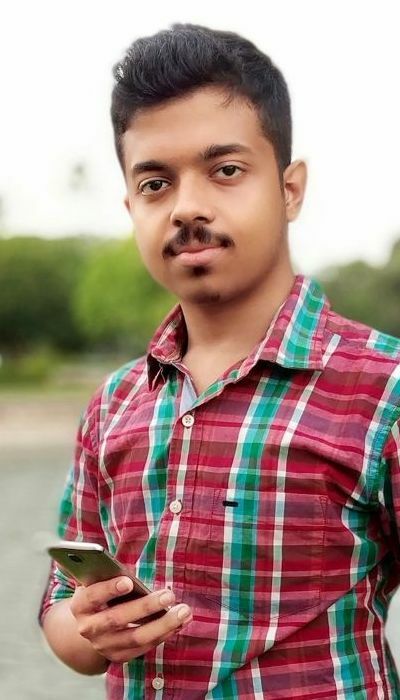 However, keep in mind that you shouldn’t unnaturally use hundreds of such variants in a single post or similar content of your website with an aim to dominate the SERPs for all those terms/phrases. That’d be an advanced form of keyword stuffing at best. While writing, you should focus on providing your readers as much relevant information on the topic as possible. If you think that an external link to a high-authority site would be found useful by the readers, don’t hesitate to link to that site. Inbound links from high-authority sites can boost your site’s SEO, but did you know that linking out to them in your posts can tell search engines that your site is trusted? 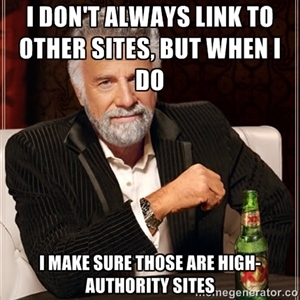 Linking out to high-authority trusted sites helps boost the Trust Score of your own site. This basically tells the search engines, “Look, that site linked to a known high-quality website from that post, it must be trustable too”. This also lets the bots know that the post on your site can be related to those high-quality ones that you’ve linked to. 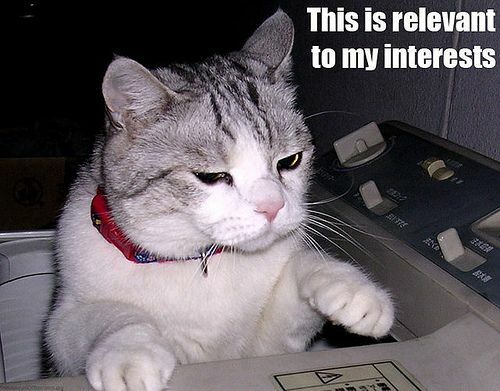 Do you aim to rank mediocre content high in SERPs, or great stuff? If you aim for the former, then I’ve got some bad news for you. Google is constantly updating its algorithms to push great content high up in SERPs. The kind of content that’s loved by the end-users. It doesn’t matter that you post something totally unique, if no one cares about it. You should analyse your site and learn what works for it and what doesn’t. What gets social shares and user engagement and what doesn’t. Social signals are an increasingly important search engine ranking factor, according to many expert SEOs. Something that works for your competitor isn’t guaranteed to work for you. For example, list-type posts, analysis, insights work well on this site, whereas detailed tutorials work the best in our forum. This doesn’t mean you can’t get content ideas from other sites in your niche. You surely can. If a post on a particular was of great interest to a related site’s audience, chances are that your audience too will love a post on that topic. 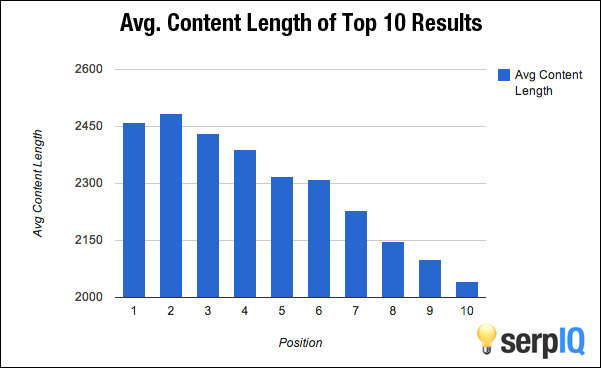 The length of the content has a positive impact on SEO, as found by this serpIQ survey. As you can see in the image above, the average top 10 search results for various queries are typically more than 2,000 words in length. My most popular post, which got shared the most no. of times in social networks is about boosting WordPress SEO. It is around 4,500 words in length. Google loves content-rich sites not because they think that lengthy posts are more valuable, but because actual users love them. This doesn’t mean you should expand a bunch of ‘non-expandable’ posts. Where you can include a bit more details, do include them. But don’t stuff your posts with unnecessary information that users might find annoying, just for the sake of increasing word-count. 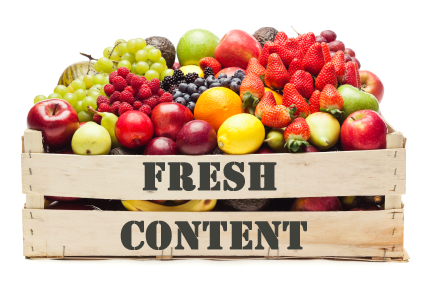 Search engines love fresh content. They give an extra edge to regularly updated pages in SERPs. For this reason, a periodically updated post about something might do better in search results than a static post about the same thing on your site. You can also use ‘recent posts’ type of sidebar/footer widgets to ensure that, to the search engines, contents on your site look like they’re updated often. Your blog homepage can be a great example of what I’m saying. If you add new posts often, and so your blog’s homepage is updated with the new ones from time to time, it sends positive signals to the search engines. If your site’s non-home pages are updated often, be it through ‘recent posts’ widgets, user comments, edits and refinements, whatever, it basically guarantees that search engine crawlers will visit your site more often. This has an added benefit. If search engine spiders visit your site frequently, chances are that new contents on your site will get indexed by search engines much faster. User-satisfaction is actually a search engine ranking factor. Why do you think Google uses over 200 ranking factors and updates its algorithms hundreds of times a year? It wants to satisfy the users with the search results. Google is giving more and more importance to user-satisfaction because it’s something that’s very hard to game. Will my readers find this useful? Is it easy to read and understand for them? You should write great content first. You can’t stop visitors from bouncing back to SERPs if they don’t find on your site what they were looking for. You can improve user-satisfaction on your site a lot by using proper post formatting – using sub-headings, bold text, italicised text, quotes etc. properly. You should choose a font that’s easy on the eyes. Reduce page load times, fix miscellaneous unresolved issues to ensure that the pages on your site cause as less inconvenience to the end-users as possible. Use of images, videos, slideshows and other multimedia make your content richer and help increase user-happiness level even further. Engaging images, videos, infographics, charts, graphs reduce bounce rate and increase time-on-site – two very important user-level ranking factors. New data suggests that search engines are learning to distinguish between the contents of different sections of websites. Like, they likely won’t count the footer or sidebar texts for relevance while crawling and indexing a blog. It’s anticipated that search engines look for similarities between the individual paragraphs within a piece of textual content. Within the same blog post, if you write about ‘wireless headphones’ in one paragraph, and ‘content marketing’ in another, it won’t be hard for search engines to find out that those aren’t quite related to each other. This doesn’t mean you shouldn’t go off-topic in your posts. This merely insists that you don’t go way too much off-topic that you deviate from the original point of the post. Rand Fishkin from Moz explained this in this Whiteboard Friday video. Implementing these advanced on-page SEO strategies should result in higher search engine rankings for your site. What’s better than on-page SEO techniques that don’t cost a penny to execute? Give them a try, they are practically quite easy to implement. What other ways do your recommend for improving on-page SEO?